Here Comes The Sun: Ace Is Going Solar! As you may know, Ace has always run on 100% renewable energy, which we feel is necessary in helping to fulfill the social and environmental branches of our “Triple Bottom Line” business model. In the past, this energy was purchased through Green Mountain Energy, an ESCO dedicated to selling “cleaner electricity to both residential (home/condo/apartment) and commercial (business) customers.” Partnering with Green Mountain Energy was a good first step but three years ago we began exploring solar options, hoping to lessen our impact even more. 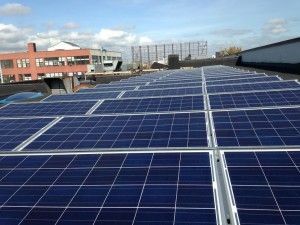 We originally planned to sign up for a Solar Power Purchase Agreement (SPPA), meaning that a company would install solar panels on the roof of our warehouse and then sell us the energy while still retaining the rights to the equipment. SPPAs are common among companies looking to lessen their environmental impact–but ultimately we decided to take our devotion to the planet a step further. After researching a few different companies, we contacted SolarOne and commissioned them to install half a million dollars worth of solar panels on our roof. One of the many advantages of this investment is that we own these panels and, should we relocate, will be able to take them with us. The price of helping the planet stay cool may be steep, but we wouldn’t be happier to have fully committed to producing over half of our own energy. Thank you for supporting Ace’s mission to make our business more environmentally sustainable and the world a safer place for all of the beings–flora and fauna included–that inhabit it!